This is a Chinese name; the family name is Wu. 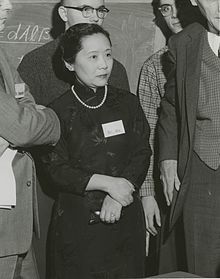 Chien-Shiung Wu (simplified Chinese: 吴健雄; traditional Chinese: 吳健雄; pinyin: Wú Jiànxióng; May 31, 1912 – February 16, 1997) was a Chinese-American experimental physicist who made significant contributions in the field of nuclear physics. Wu worked on the Manhattan Project, where she helped develop the process for separating uranium metal into uranium-235 and uranium-238 isotopes by gaseous diffusion. She is best known for conducting the Wu experiment, which contradicted the hypothetical law of conservation of parity. This discovery resulted in her colleagues Tsung-Dao Lee and Chen-Ning Yang winning the 1957 Nobel Prize in physics, and earned Wu the inaugural Wolf Prize in Physics in 1978. Her expertise in experimental physics evoked comparisons to Marie Curie. Her nicknames include "the First Lady of Physics", "the Chinese Madame Curie", and the "Queen of Nuclear Research". Chien-Shiung Wu was born in the town of Liuhe in Taicang, Jiangsu province, China, on May 31, 1912, the second of three children of Wu Zhong-Yi (吳仲裔) and Fan Fu-Hua. The family custom was that children of this generation had Chien as the first character (generation name) of their forename, followed by the characters in the phrase Ying-Shiung-Hao-Jie, which means "heroes and outstanding figures". Accordingly, she had an older brother, Chien-Ying, and a younger brother, Chien-Hao. Wu and her father were extremely close, and he encouraged her interests passionately, creating an environment where she was surrounded by books, magazines, and newspapers. Wu received her elementary school education at Ming De School, a school for girls founded by her father. She left her hometown in 1923 at the age of 11 to go to the Suzhou Women's Normal School No. 2. This was a boarding school with classes for teacher training as well as for regular high school. Admission to teacher training was more competitive, as it did not charge for tuition or board and guaranteed a job on graduation. Although her family could have afforded to pay, Wu chose the more competitive option and was ranked ninth among around 10,000 applicants. In 1929, Wu graduated at the top of her class and was admitted to National Central University in Nanjing. According to government regulations of the time, teacher-training college students wanting to move on to universities needed to serve as schoolteachers for one year. In Wu's case, this was only nominally enforced. She went to teach at a public school in Shanghai, the president of which was the philosopher Hu Shih, whose class she took. From 1930 to 1934, Wu studied at National Central University (later renamed Nanjing University and reinstated in Taiwan), first in mathematics, but later transferring to physics. She became involved in student politics. Relations between China and Japan were tense at this time, and students were urging the government to take a stronger line with Japan. Wu was elected as one of the student leaders by her colleagues because they felt that since she was one of the top students at the university, her involvement would be forgiven, or at least overlooked, by the authorities. That being the case, she was careful not to neglect her studies. She led protests that included a sit-in at the Presidential Palace in Nanjing, where the students were met by Chiang Kai-shek. For two years after graduation, she did graduate-level study in physics and worked as an assistant at Zhejiang University. She became a researcher at the Institute of Physics of the Academia Sinica. Her supervisor was Gu Jing-Wei, who had earned her PhD abroad at University of Michigan and encouraged Wu to do the same. Wu was accepted by University of Michigan, and her uncle, Wu Zhou-Zhi, provided the necessary funds. She embarked for the United States with a female friend, Dong Ruo-Fen (董若芬), a chemist from Taicang, on the SS President Hoover in August 1936. Her parents and uncle saw her off. She would never see her parents again. Chien-Shiung Wu (left) with Wallace Brode (right) at Columbia University in 1958. The two women arrived in San Francisco, where Wu's plans for graduate study changed after visiting the University of California, Berkeley. She met physicist Luke Chia-Liu Yuan, a grandson of Yuan Shikai (the first President of the Republic of China and self-proclaimed Emperor of China). Yuan showed her the Radiation Laboratory, where the director was Ernest O. Lawrence, who would soon win the Nobel Prize for Physics in 1939 for his invention of the cyclotron particle accelerator. Wu heard that at Michigan women were not even allowed to use the front entrance, and decided that she would prefer to study at Berkeley. Yuan took her to see Raymond T. Birge, the head of the physics department, and he offered Wu a place in the graduate school despite the fact that the academic year had already commenced. Wu then abandoned her plans to study at Michigan and enrolled at Berkeley. Her Berkeley classmates included Robert R. Wilson and George Volkoff; her friends included Ursula Schaefer, a history student who chose to remain in the United States rather than return to Nazi Germany, and Margaret Lewis, an American post-doctoral student. Wu applied for a scholarship at the end of her first year, but there was prejudice against Asian students, and Wu and Yuan were instead offered a readership with a lower stipend. Yuan then applied for, and secured, a scholarship at Caltech. Wu made rapid progress in her education and her research. Although Lawrence was officially her supervisor, she also worked closely with Emilio Segrè. Her thesis had two separate parts. The first was on bremsstrahlung, the electromagnetic radiation produced by the deceleration of a charged particle when deflected by another charged particle, typically an electron by an atomic nucleus. She investigated this using beta-emitting phosphorus-32, a radioactive isotope easily produced in the cyclotron that Lawrence and his brother John H. Lawrence were evaluating for use in cancer treatment and as a radioactive tracer. This marked Wu's first work with beta decay, a subject on which she would become an authority. The second part of the thesis was about the production of radioactive isotopes of xenon produced by the nuclear fission of uranium with the 37-inch and 60-inch cyclotrons at the Radiation Laboratory. Wu completed her Ph.D. in June 1940, and was elected to Phi Beta Kappa. In spite of Lawrence and Segrè's recommendations, she could not secure a position at a university, so she remained at the Radiation Laboratory as a post-doctoral fellow. Wu and Yuan were married at the home of Robert Millikan, Yuan's academic supervisor and the President of Caltech, on May 30, 1942. Neither the bride's nor the groom's families were able to attend due to the outbreak of the Pacific War. Wu and Yuan moved to the East Coast of the United States, where Wu became a faculty member at Smith College, a private women's college in Northampton, Massachusetts, while Yuan worked on radar for RCA. She found the job frustrating, as her duties involved teaching only, and there was no opportunity for research. She appealed to Lawrence, who wrote letters of recommendation to a number of universities. Smith responded by making Wu an associate professor and increasing her salary. She accepted a job from Princeton University in New Jersey as an instructor for naval officers. In March 1944, Wu joined the Manhattan Project's Substitute Alloy Materials (SAM) Laboratories at Columbia University. She lived in a dormitory there, returning to Princeton on the weekends. The role of the SAM Laboratories, headed by Harold Urey, was to support the Manhattan Project's gaseous diffusion (K-25) program for uranium enrichment. Wu worked alongside James Rainwater in a group led by William W. Havens, Jr., whose task was to develop radiation detector instrumentation. In September 1944, Wu was contacted by the Manhattan District Engineer, Colonel Kenneth Nichols. The newly commissioned B Reactor at the Hanford Site had run into an unexpected problem, starting up and shutting down at regular intervals. John Archibald Wheeler suspected that a fission product, xenon-135, with a half-life of 9.4 hours, was the culprit, and might be a neutron poison. Segrè then remembered the work that Wu had done at Berkeley on the radioactive isotopes of xenon. The paper on the subject was still unpublished, but Wu and Nichols went to her dorm room and collected the typewritten draft prepared for the Physical Review. Xenon-135 was indeed the culprit; it turned out to have an unexpectedly large neutron absorption cross-section. After the end of the war in August 1945, Wu accepted an offer of a position as an associate research professor at Columbia. Communication with China was restored, and Wu received a letter from her family, but plans to visit China were disrupted by the Chinese Civil War, and the birth in 1947 of a son, Vincent Yuan (袁緯承), who would grow up to become a physicist like his parents. In 1949, Yuan joined the Brookhaven National Laboratory, and the family moved to Long Island. After the communists came to power in China that year, Wu's father wrote urging her not to return. Since her passport had been issued by the Kuomintang government, she found it difficult to travel abroad. This eventually led to her decision to become a US citizen in 1954. She would remain at Columbia for the rest of her career. She became an associate professor in 1952, a full professor in 1958, and the Michael I. Pupin Professor of Physics in 1973. Her students called her the Dragon Lady, after the character of that name in the comic strip Terry and the Pirates. 4) was being used as a copper-64 beta ray source, which was causing the emitted electrons to lose energy. To get around this, she adapted an older form of spectrometer, a solenoidal spectrometer. She added detergent to the copper sulphate to produce a thin and even film. She was then able to demonstrate that the discrepancies observed were the result of experimental error; her results were consistent with Fermi's theory. Lee and Yang's research into existing experimental results convinced them that parity was conserved for electromagnetic interactions and for the strong interaction. For this reason, scientists had expected that it would also be true for the weak interaction, but it had not been tested, and Lee and Yang's theoretical studies showed that it might not hold true for the weak interaction. Lee and Yang worked out a pencil-and-paper design of an experiment for testing conservation of parity in the laboratory. Lee then turned to Wu for her expertise in choosing and then working out the hardware manufacture, set-up, and laboratory procedures for carrying out this experiment. Wu chose to do this by taking a sample of radioactive cobalt-60 and cooling it to cryogenic temperatures with liquid gases. Cobalt-60 is an isotope that decays by beta particle emission, and Wu was also an expert on beta decay. The extremely low temperatures were needed to reduce the amount of thermal vibration of the cobalt atoms to practically nil. Also, Wu needed to apply a constant and uniform magnetic field across the sample of cobalt-60 in order to cause the spin axes of the atomic nuclei to line up in the same direction. For this cryogenic work, she needed the facilities of the National Bureau of Standards and its expertise in working with liquid gases, and traveled to its headquarters in Maryland with her equipment to carry out the experiments. Lee and Yang's theoretical calculations predicted that the beta particles from the cobalt-60 atoms would be emitted asymmetrically and the hypothetical "law of conservation of parity" was invalid. Wu's experiment showed that this is indeed the case: parity is not conserved under the weak nuclear interactions.
. This result was soon confirmed by her colleagues at Columbia University in different experiments, and as soon as all of these results were published—in two different research papers in the same issue of the same physics journal—the results were also confirmed at many other laboratories and in many different experiments. The discovery of parity violation was a major contribution to particle physics and the development of the Standard Model. In recognition of their theoretical work, Lee and Yang were awarded the Nobel Prize for Physics in 1957. Wu's role in the discovery was not publicly honored until 1978, when she was awarded the inaugural Wolf Prize. The experiments of Columbia University physicists (left to right) Wu, Y.K. Lee, and L.W. Mo confirmed the theory of conservation of vector current. In the experiments, which took several months to complete, proton beams from Columbia's Van de Graaff accelerator were transmitted through pipes to strike a 2 mm boron target at the entrance to a spectrometer chamber. In 1963, Wu experimentally demonstrated a universal form of Fermi's beta decay model, confirming the Conserved Vector Current hypothesis of Richard Feynman and Murray Gell-Mann on the road to the Standard Model. Her demonstration that parity was not conserved brought other assumptions that physicists had made about the weak interaction into question. If parity is not conserved in weak force interaction, what about charge conjugation? This was an effect that held true for electromagnetism, gravity and the strong interaction, so it had been assumed that it would hold for the weak interaction too. Wu conducted a series of experiments on double beta decay in a salt mine under Lake Erie that proved that charge conjugation was not conserved either. Another important experiment carried out by Wu was the first experimental confirmation of quantum results relevant to a pair of entangled photons as applicable to the Einstein-Podolsky-Rosen (EPR) paradox. Wu's results confirmed E.M.L. Pryce and John Clive Ward's calculations on the correlation of the quantum polarizations of two photons propagating in opposite directions. Wu later conducted research into the molecular changes in the deformation of hemoglobins that cause sickle-cell disease. She also did research on magnetism and the Mössbauer effect during the 1960s. She wrote a textbook with Steven Moszkowski [de], Beta Decay, which was published in 1966 and became a standard reference on the subject. Wu's older brother died in 1958, her father in 1959 and her mother in 1962. The United States had severe restrictions on travel abroad by its citizens, so she was not permitted to visit China to attend their funerals. She saw her uncle, Wu Zhou-Zhi, and younger brother, Wu Chien-Hao, on a trip to Hong Kong in 1965. After the 1972 Nixon visit to China, relations between the two countries improved, and she was able to visit China again in 1973. By this time her uncle and brother had perished in the Cultural Revolution and the tombs of her parents had been destroyed. She was greeted by Zhou Enlai, who personally apologized for the destruction of the tombs. After this, she returned to China several times. In later life, Wu became more outspoken. She protested the imprisonment in Taiwan of relatives of physicist Kerson Huang in 1959 and of the journalist Lei Chen in 1960. In 1964, she spoke out against gender discrimination at a symposium at the Massachusetts Institute of Technology. "I wonder," she asked her audience, "whether the tiny atoms and nuclei, or the mathematical symbols, or the DNA molecules have any preference for either masculine or feminine treatment." When men referred to her as Professor Yuan, she immediately corrected them and told them that she was Professor Wu. In 1975, Robert Serber, the new chairman of the Physics Department at Columbia University, adjusted her pay to make it equal to that of her male counterparts. She protested the crackdown in China that followed the Tiananmen Square massacre of 1989. Wu retired in 1981 and became a professor emerita. She died on February 16, 1997, in New York City at the age of 84 after suffering a stroke. An ambulance rushed her to St. Luke's–Roosevelt Hospital Center, but she was pronounced dead on arrival. She was survived by her husband and son. In accordance with her wishes, her ashes were buried in the courtyard of the Ming De School that her father had founded and she had attended as a girl. Wu, C.-S. (1950). "Recent Investigation of the Shapes of β-Ray Spectra". Reviews of Modern Physics. 22 (4): 386–398. Bibcode:1950RvMP...22..386W. doi:10.1103/RevModPhys.22.386. Wu, C. S.; Moszkowski, S. A. (1966). Beta Decay. New York: Interscience Publishers. LCCN 65-21452. OCLC 542299. Wu, C.-S. (1975). "Can We Save Basic Research?". Physics Today. 281 (12): 88. Bibcode:1975PhT....28l..88W. doi:10.1063/1.3069274. ^ Chiang, T.-C. (November 27, 2012). "Inside Story: C S Wu – First Lady of physics research". CERN Courier. Retrieved April 5, 2014. ^ Hammond 2007, p. 1. ^ Benczer-Koller, Noemie (2009). "Chien-Shiung Wu, 1912–1997" (PDF). National Academy of Sciences. ^ a b Chiang 2014, pp. 3–5. ^ a b c d McGrayne 1998, p. 254–260. ^ Wang & 1970–80, p. 364. ^ Chiang 2014, p. 11. ^ Chiang 2014, pp. 15–19. ^ "吴健雄" (in Chinese). China Network. Archived from the original on November 3, 2015. Retrieved August 16, 2015. ^ a b Weinstock, M. (October 15, 2013). "Chien-Shiung Wu: Courageous Hero of Physics". Scientific American. Retrieved October 17, 2013. ^ a b Chiang 2014, pp. 30–31. ^ Benczer-Koller, Noemie (2009). "Chien-Shiung Wu 1912–1997" (PDF). Biographical Memoirs: 3–16. Retrieved May 5, 2015. ^ Chiang 2014, pp. 31–34. ^ Chiang 2014, p. 172. ^ Chiang 2014, p. 39. ^ Hammond 2007, p. 20. ^ a b Chiang 2014, p. 43. ^ Klein, Melanie (August 21, 1996). "Ursula Lamb, UA historian, dies at 82". Arizona Daily Wildcat. Archived from the original on April 5, 2015. ^ a b Chiang 2014, pp. 44–45. ^ Heilbron & Seidel 1989, pp. 399–414. ^ a b c d e Wang & 1970–80, p. 365. P". Physical Review. 59 (6): 481–488. Bibcode:1941PhRv...59..481W. doi:10.1103/PhysRev.59.481. ^ Wu, Chien-Shiung; Segrè, Emilio (March 1945). "Radioactive Xenons". Physical Review. 67 (5–6): 142–149. Bibcode:1945PhRv...67..142W. doi:10.1103/PhysRev.67.142. ^ Cooperman 2004, p. 39. ^ Chiang 2014, p. 66. ^ Chiang 2014, pp. 71–74. ^ Chiang 2014, p. 77. ^ a b Chiang 2014, pp. 95–96. ^ Hammond 2007, p. 40. ^ Chiang 2014, p. 246. ^ Hammond 2007, p. 55. ^ a b Wang & 1970–80, p. 366. ^ a b Chiang 2014, pp. 80–81. ^ Chiang 2014, p. 108. ^ Hammond 2007, pp. 187–188. ^ Chiang 2014, p. 114. ^ Chiang 2014, p. 107. ^ Hammond 2007, pp. 46–48. ^ Hammond 2007, pp. 64–67. ^ Chiang 2014, pp. 123–125. are two different decay modes of the same particle, which necessarily has a single mass value and a single lifetime. ^ Chiang 2014, pp. 126–128. ^ Hammond 2007, pp. 76–82. ^ a b Chiang 2014, pp. 136–139. ^ Wu, C. S.; Ambler, E.; Hayward, R. W.; Hoppes, D. D.; Hudson, R. P. (1957). "Experimental Test of Parity Conservation in Beta Decay" (PDF). Physical Review. 105 (4): 1413–1415. Bibcode:1957PhRv..105.1413W. doi:10.1103/PhysRev.105.1413. ^ Garwin, R. L.; Lederman, L. M.; Weinrich, M. (1957). "Observations of the failure of conservation of parity and charge conjugation in meson decays: the magnetic moment of the free muon" (PDF). Physical Review. 105 (4): 1415–1417. Bibcode:1957PhRv..105.1415G. doi:10.1103/PhysRev.105.1415. ^ Ambler, E.; Hayward, R. W.; Hoppes, D. D.; Hudson, R. P.; Wu, C. S. (1957). "Further Experiments on Decay of Polarized Nuclei" (PDF). Physical Review. 106 (6): 1361–1363. Bibcode:1957PhRv..106.1361A. doi:10.1103/PhysRev.106.1361. ^ Chiang 2014, p. 142. ^ a b c d e f g h i j Chiang 2014, pp. 228–231. ^ Chiang 2014, pp. 160–163. ^ Wu, C. S.; Shaknov, I. (1950). "The Angular Correlation of Scattered Annihilation Radiation". Physical Review. 77 (1): 136. Bibcode:1950PhRv...77..136W. doi:10.1103/PhysRev.77.136. ^ Pryce, M. H. L.; Ward, J. C. (1947). "Angular Correlation Effects with Annihilation Radiation". Nature. 160 (4065): 435. Bibcode:1947Natur.160..435P. doi:10.1038/160435a0. ^ Dalitz, R. H.; Duarte, F. J. (2000). "John Clive Ward". Physics Today. 53 (10): 99. Bibcode:2000PhT....53j..99D. doi:10.1063/1.1325207. ^ Duarte, F. J. (2012). "The origin of quantum entanglement experiments based on polarization measurements". European Physical Journal H. 37 (2): 311–318. Bibcode:2012EPJH...37..311D. doi:10.1140/epjh/e2012-20047-y. ^ a b Chiang 2014, p. 166. ^ a b Chiang 2014, p. 111. ^ a b Nelson, B. (February 21, 1997). "Famed Physicist Chien-Shiung Wu Dies at 84". Columbia University Record. 22 (15). Retrieved October 17, 2013. ^ Chiang 2014, pp. 204–206. ^ Chiang 2014, pp. 198–199. ^ a b Wang & 1970–80, p. 367. ^ Chiang 2014, p. 171. ^ Chiang 2014, p. 183. ^ a b Wang & 1970–80, p. 368. ^ Chiang 2014, p. 251. ^ a b c d e f g Hammond 2007, pp. 100–102. ^ Chiang 2014, pp. 183–184. ^ Wang, Zuoyue (2007). "Wu Chien-Shiung" (PDF). New Dictionary of Scientific Biography. 7. New York: Charles Scribner's Sons. pp. 363–368. ^ "21 Inducted Into Women's Hall of Fame". Los Angeles Times. July 12, 1998. Retrieved May 17, 2017. Chiang, Tsai-Chien (2014). Madame Chien-Shiung Wu: The First Lady of Physics Research. World Scientific. ISBN 978-981-4374-84-2. Cooperman, Stephanie H. (2004). Chien-Shiung Wu: Pioneering Physicist and Atomic Researcher. Rosen Publishing Group. p. 39. ISBN 978-0-8239-3875-9. Hammond, Richard (2007). Chien-Shiung Wu: Pioneering Nuclear Physicist. Chelsea House Publishers. ISBN 978-0-8160-6177-8. Heilbron, J. L.; Seidel, Robert W. (1989). Lawrence and his Laboratory: A History of the Lawrence Berkeley Laboratory. Berkeley, California: University of California Press. ISBN 978-0-520-06426-3. OCLC 19455957. Retrieved May 24, 2015. McGrayne, Sharon Bertsch (1998). Nobel Prize Women in Science: Their Lives, Struggles, and Momentous Discoveries (Revised ed.). Joseph Henry Press. pp. 254–260. ISBN 978-0-309-07270-0. Wang, Zuoyue (1970–80). "Wu Chien-Shiung". Dictionary of Scientific Biography. 25. New York: Charles Scribner's Sons. pp. 363–368. ISBN 978-0-684-10114-9. Reynolds, Moira Davison (2004). American Women Scientists: 23 Inspiring Biographies, 1900–2000. Jefferson, N.C.: McFarland. ISBN 978-0-7864-2161-9. OCLC 60686608. Wikimedia Commons has media related to Chien-shiung Wu.